Home » Dr. Bhim Rao Ambedkar » कविताएं » बाबा साहेब डॉ. भीम राव अम्बेडकर जी को समर्पित..
संविधान निर्माता भारत रत्न बोधिसत्व बाबा साहेब डॉ. 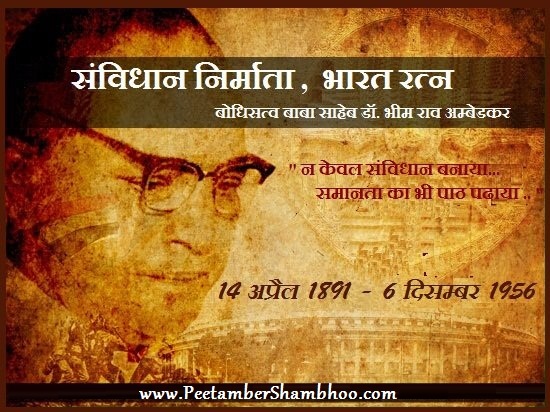 भीम राव अम्बेडकर का 126वां जन्मदिन आज है ..
Today is 126th birth anniversary of Baba Saheb Dr. Bhimrao Ramji Ambedkar. A salute to the architect of the Indian Constitution and deepest gratitude to you for fighting against and abolishing the ages old social discrimination which was rampant in India and uplifting the lower castes from the millennia old inhuman behaviour & injustice. And for guaranteeing Freedom and Right to live with self-respect to every citizen of India. Thank You ! You will always be a source of inspiration to me. "बाबा साहेब जी को समर्पित मेरी एक कविता "
हर एक मार्ग देख लिया उन्होंने ..
उनके जितना न था किसी के पास ज्ञान..
छोटी सी कविता में इतने बड़े इंसान को बयां कैसे करू..